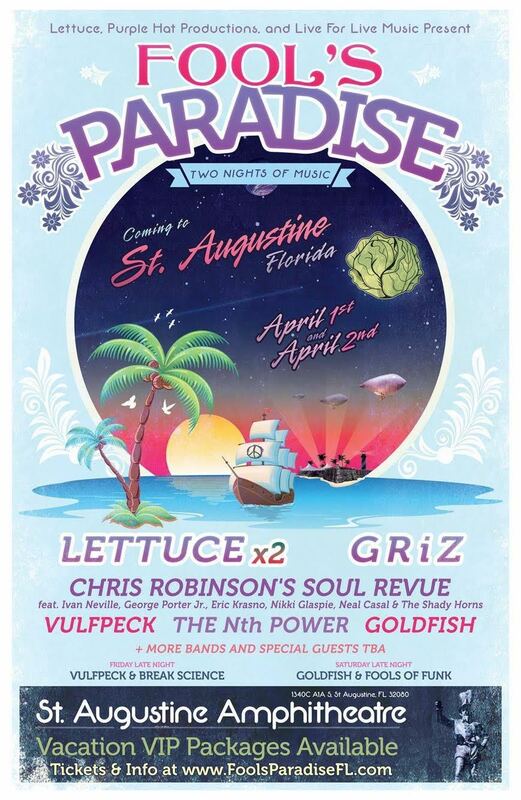 On April 1 & 2, 2016, Lettuce, Purple Hat Productions, and Live for Live Music will host Fool’s Paradise, a funk-fueled beach extravaganza taking place in the heart of one of America’s most historic cities: St. Augustine, FL. The inaugural event, held at the St. Augustine Amphitheatre, will feature two explosive sets from New York funk masters Lettuce, along with: electro soul future-funk producer/saxophonist GRiZ, rising retro-soul stars Vulfpeck, and Chris Robinson’s Soul Revue ft. George Porter Jr. (The Meters), Ivan Neville (Dumpstaphunk), Nikki Glaspie (The Nth Power), Eric Krasno (Lettuce/Soulive), Neal Casal (Chris Robinson Brotherhood) & The Shady Horns. Supporting acts including South Africa’s organic live house duo Goldfish and the progressive soul, R&B and gospel of The Nth Power. Additional special guests will be announced soon, and several cross-collaborations amongst bands are to be expected at the event. Fool’s Paradise is bringing your favorite bands to the beach. For two full days, there will be genre-bending music, artist-led excursions, musical workshops, yoga and activities just steps from the ocean. In addition, a number of late night shows will be hosted by some of the most talented musicians in the industry! This includes Break Science, Vulfpeck, Goldfish and Fools of Funk, an all-star supergroup of musicians. Thrown in conjunction with the organizers of some of the Southeast’s most treasured festivals, including Suwannee Hulaween, Bear Creek, and AURA, Fool’s Paradise is set to take place at St. Augustine Amphitheatre, a 16-acre section of Anastasia State Park and home to a state-of-the-art performing arts venue. Campgrounds and beach shores make up this perfect Florida landscape. St. Augustine is roughly one hour from Jacksonville, one hour from Gainesville, and two hours from Orlando and five hours from Miami. The oldest city in the United States and fabled home to the Fountain of Youth, St. Augustine’s unique scenery and historical presence sets the city apart from any other in the country. With over 42 miles of beaches, incredible restaurants and bars, jetskiing, kayaking, fort tours, ziplining over an alligator farm, parasailing, and its own distillery, attendees will have plenty to explore. With music all day and night and tons of local activities, Fool’s Paradise is a premier destination event like no other. Once in a lifetime artist-led excursions will soon be announced, allowing you to embark on a water adventure, play a sport, take a workshop, and participate in a local activity with some of your favorite musicians in an intimate setting.